Table setting details in gold, white and crystal are enhanced with fernlike greens at this stunningly fresh wedding at The Lodge at Torrey Pines designed by Crown Weddings & Events. From the custom painted menus [keepsake works of art!] to a pretty leaf on a perfectly folded napkin - these details assembled with an artists’s eye; sparkly crystal catching the light, gorgeous brush painted gold charger plate and stunning florals, bring together a classic meets modern vibe. San Diego Wedding Venue Spotlight: The Lodge at Torrey Pines. Situated on La Jolla’s coastline with panoramic views of the world-renowned Torrey Pines Golf Course, The Lodge at Torrey Pines is a wedding setting unlike any other. Historical Craftsman architecture complements an elegant selection of wedding venues to accommodate everything from intimate dinners for 10 to lavish celebrations for 220 guests. Exquisite dining and their legendary AAA Five Diamond service ensure your wedding day will be unforgettable. Native peoples traditionally believed that the night air is filled with dreams, both good and bad. Sometimes referred to as "Sacred Hoops," Dreamcatchers - like these made by local artist JasmineJOYs - were created to give people protection and sweet dreams. 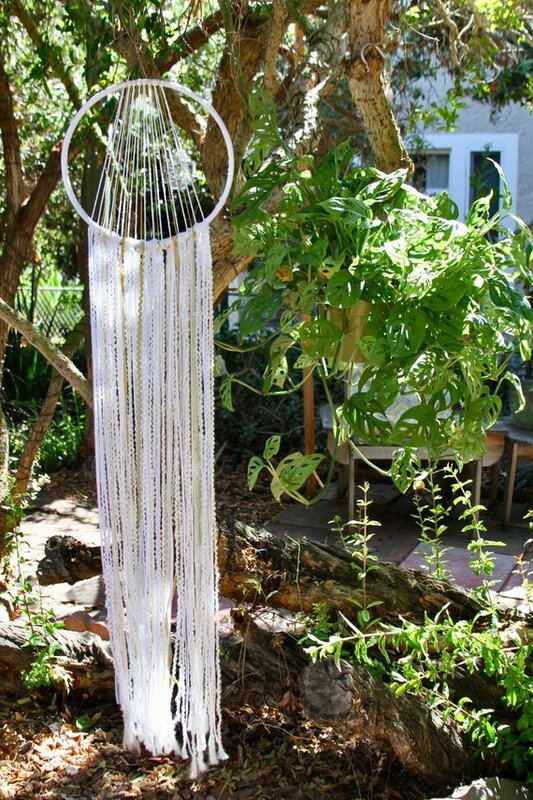 Dreamcatchers make a beautiful and meaningful ceremony backdrop for any boho wedding! Sweet dreams of love and marriage to you all!!! Local metal crafters and artists Enticing Tables create really cool metal table and florals stands, arches, cake stands, chandeliers, and more that are perfect for any wedding! We just love this "Love Birds" Floral Stand Centerpiece of theirs for a garden wedding! Dimensions: Base: 10" diameter, Height: 38"
Swag: You Want it and San Diego Florist Jennifer Cole’s Got It! We love swag done right! The type of swag that means confidence, attitude, and bold style like this beautiful blush drape swag at La Valencia Hotel by super talented florist, San Diego's very own Jennifer Cole! If you love amazing floral designs and wedding decor follow Jennifer Cole on Instagram! Stepping into your new life as a married couple is like walking through a beautiful door! And isn't this decorated aisle entry door set a heavenly way to start your walk to your true love?! Thanks to Concepts Event Design who rent these beauties and florist Adorations Botanical Artistry at ocean view wedding venue L'Auberge Del Mar, planned and coordinated by Merilee of Ever After Events, and photographed by Garrett Richardson Photography. Your lifetime of love awaits!